Offering one of the better selections of single-family homes on John's Island, Headquarters Plantation’s houses are nothing short of superb. 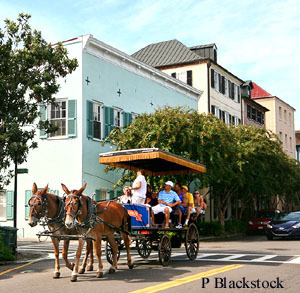 The closest Johns Island neighborhood to downtown Charleston, commuting time is just a bit more than 10 minutes with the beach about a 15-minute drive. A gated community of luxury homes, prices start in the upper $300s and range up to $1 million and more for homes fronting the Stono River. Literally an island surrounded by the Stono River and marshland, access to the neighborhood is made off the Stono River Bridge. Many of its homes offer beautiful marsh views as well as private docks. In addition, the St. John’s Yacht Harbor and Marina, also on Headquarters Island, offers boat storage and a full service marina. While being on its own island makes the neighborhood seem isolated, the plantation is less than four miles from major shopping centers and the Charleston Municipal Golf Course is just three miles away. For beach lovers, Folly Beach is 12 miles distant. Less than five miles away, James Island County Park has miles of hiking and biking trails in 600-plus acres, plus the state’s largest outdoor climbing wall, a dog park, Splash Zone Waterpark, kayak rentals and much more.